"How do you tell your part in the biggest tale in history? "I ask because it's what I have to do. I'm Zoe Boutin Perry: A colonist stranded on a deadly pioneer world. Holy icon to a race of aliens. A player (and a pawn) in a interstellar chess match to save humanity, or to see it fall. Witness to history. Friend. Daughter. Human. Seventeen years old. "Everyone on Earth knows the tale I am part of. But you don't know my tale: How I did what I did - how I did what I had to do - not just to stay alive but to keep you alive, too. All of you. I'm going to tell it to you now, the only way I know how: not straight but true, the whole thing, to try make you feel what I felt: the joy and terror and uncertainty, panic and wonder, despair and hope. Everything that happened, bringing us to Earth, and Earth out of its captivity. All through my eyes. "It's a story you know. But you don't know it all." This is a tough review to write. I greatly enjoyed the first three books in the "Old Man's War" series, and picked this up without hesitation - as it was listed next in line. However, this is not a book targeted at adults even though it's mistakingly placed in Contemporary SciFi. This is pure bait and switch to sell a few more copies to unsuspecting customers. 1. "Zoe's Tale" is Young Adult Science Fiction. 2. "Zoe's Tale" is an almost verbatim retelling of "The Last Colony", except it's the "Twilight" version. I'm quite miffed at Audible & the publisher for not prominently calling this out, and classifying the book correctly. It's strange that Scalzi chose to re-write "The Last Colony" entirely from a teenagers point of view. I had expected Zoe to START OUT as a teenager, then slowly grow into a woman as the story moved forward. However, what I got was Scalzi channeling giggling girls, fart jokes, and teenage crushes. Really? Had I not been on some very long airline flights, this book would have been returned for refund posthaste. It's clear that there was a kernel of a story hidden in "The Last Colony", where Zoe impressed General Gau, and somehow wrangled an impressive piece of technology from The Consu. However, Scalzi does very little with those events, and thus you'll spend the entire book building up to a rather flat third act. The one shining star in this whole mess was the narrator: Tavia Gilbert. She grew on me quickly, and her voice acting was very well done. So - would I recommend this book to a teenager? No. Why? Because, they'd be dropped into a series 2/3'ds of the way through, with no other books voiced for them before or after. Scalzi is a good writer, but your credits would be better spent on his other work. Zoe's Tale was fun to listen to. The reader was skilled at adding emotion to the story and was a good actress. The story itself filled in some gaps and added some dimensions to the story told in "The Last Colony". Whether that information was enough to justify another book must be left for the individual reader/listener. For myself, there was too little new. The most glaring problem that I had with the audio release was that the reader of this story had obviously not listened to the previous volumes. The differences in pronunciations from previous volumes to this one always took me out of the story. A common pronunciation guide should be a "must". Still, this book fleshed out characters that otherwise would have, for space reasons, recieved too little attention otherwise. Worth listening to, especially if you have an extra "credit". 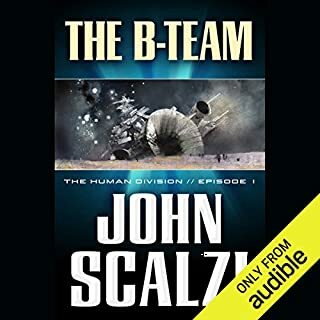 Too much a repeat of "The Last Colony"
I'll start with the good: I admire John Scalzi as a writer, and all his skill with words is evident here. 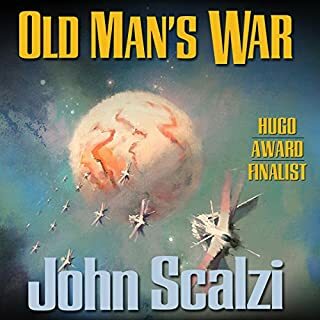 His "Old Man's War" series is a general homage to the works of Robert Heinlein; in this novel he captures the intelligence and attitude of a typical Heinlein precocious teenager from his young-adult novels. I'll also compliment Tavia Gilbert as a reader. She gets the tone of a teen-age girl exactly right, along with the "I'm always in control" attitude of Zoe. With all that, I can only give this two stars. 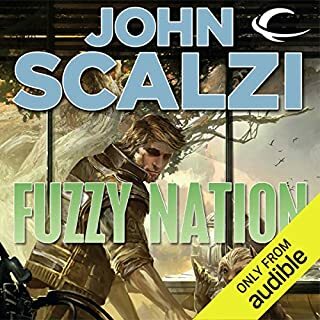 The problem is that I listened to Scalzi's "The Last Colony" only a few months ago. Every plot point or bit of information I listened to in "Zoe's Tale" was something I already knew. There were no surprises. I found I simply was not interested. I listened to first half hour of part 1, trying to give it a chance. Then I skipped to part 2. I listened to no more than five minutes before I realized I knew exactly in what part of the story from "The Last Colony" I was in, and listened to at least two plot points repeated from that previous book. I couldn't take it anymore. 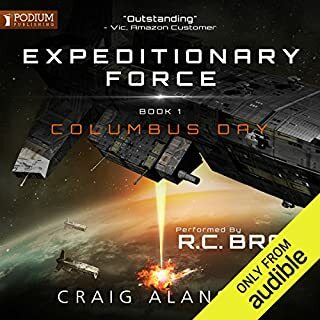 If you haven't listened to "The Last Colony," I can recommend this audiobook. 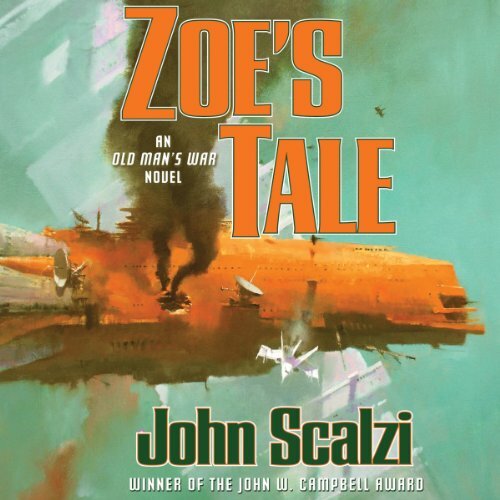 If you've listened "The Last Colony" and you like to listen to audiobooks more than once, wait whatever interval you normally wait between successive listens to the same book before listening to "Zoe's Tale." 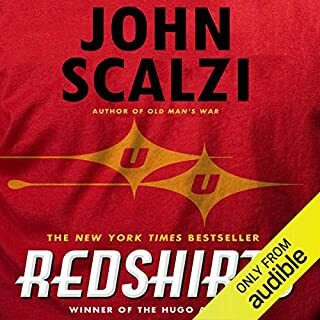 Otherwise, I suggest you get "The Human Division" or "Redshirts", two other novels by John Scalzi available on Audible. Read the previous books first. Do not read this book unless you've read the previous books in this series. The Last Colony is particular is required listening before listening to this book. 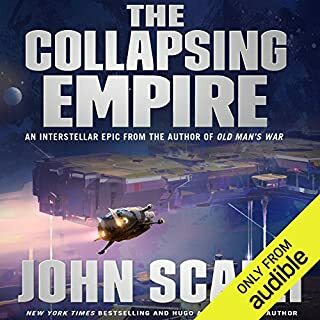 I can't imagine anyone will like this book very much if they haven't listened to The Last Colony first, as this book covers the event of that book from a different perspective. Let me start by saying, it's very rare for me to enjoy listening to a female narrator. I don't think there are very many talented female narrators, and much prefer to listen to men in most cases. That said, Tavia Gilbert gave a pretty amazing performance. The sarcasm came across really well, and in many scenes you could just feel the emotion in her words. She's definitely one of my favorite narrators now, and I will be looking specifically at books narrated by her in the future. Those of you that listen to books fairly often know how important it is to have a good narrator. I think that the perspective shift of this book adds a lot to the story that was already there. Zoe is a strong character that's hard not to like. It goes into far more detail concerning Zoe's relationship with the Obin, especially Hickery and Dickery. I was surprised at how much I enjoyed reading about Zoe's relationship with her boyfriend Enzo. I'm not usually big into love stories, but it was very well done in this book. Frankly, I was surprised at how much I ended up enjoying this book altogether. You shouldn't go into this book expecting Old Man's War. There aren't a lot of great battle scenes with lots of action. This is the events of The Last Colony from the perspective of a strong teenage girl thrust into adulthood before she should be. My only regret in finishing this book is that there are no longer any more books set in this universe to read. I loved them all, and Zoe's tale in particular has a special place in my heart. I urge everyone to give it a try. Let preface everything by I love the first two books by John Scalzi. This book is however a huge departure from his previous work Old Man's War and Ghost Brigades story lines. It is told from the first person narrative of Zoe, a 15 year old girl. I have a 14 year old bright girl, but this book accurately portrays some of peculiarities that viewpoint for better or worse. Being a first person story, its perspective was limited and some of the more interesting events are simply glossed over. This book would be ideal for Young Adult with its love story, but for a thirty-something adult I was outside the intended age group. this was a total lazy RIP off. I'm pissed at the author. this is a 100% re-hash of the previous book in the series but from a different characters perspective. nothing new, just a slightly different take on the last story. I WANT MY MONEY BACK. 27 bucks for NOTHING! YOU SHOULD BE ASHAMED! I liked this but it is not a military adventure like ghost or old man wars. I so enjoyed "Old Man's War", "The Sagan Diary" and "Lost Colony", which were written in this universe. I had kind of hoped that, even though this was written from the perspective of an adolescent female, it wouldn't be a juvenile book. But it is. And since any juvenile who wanted to really enjoy this would need to understand the universe created in the adult books that he or she likely never read, there is a tiresome amount of explanatory narrative. Kids will be bored and adults will be annoyed. My biggest complaint with this book is that it doesn't add much to the overall story. It basically goes over everything from the previous book, but from a different perspective. This would have been better classified as book 3.5 rather than book 4. If you are tight on credits, you can skip this one and go to the next book - Human Division. The book was great. After three books, the narrator should have taken some time to listen to the pronunciation of names before she started. I love John Scalzi books I've listened to so far and was delighted to find some new additions to add to my collection. I did purchase based on reviews so was disappointed to find I really did not enjoy this book as much as his others. First it is all centred around a teenager - Zoe. Whilst I have no issue with this subject matter I often find female teenager characters somewhat tiresome and can say this was in part over come. Mainly the book was simply not in the usual humorous engaging style I've become used to. I found the book somewhat drawn out, didn't (unfortunately) care about the main protagonist, although did stick it out to the end. Maybe because this solely focused on the 'kid' characters and not enough 'alien' character development,or humour. I guess my message is buy with caution and if you're expecting Androids Dream, Fuzzy Nation or Red Shirts this one just didn't stack up for me. I'd have preferred if the Scalzi had spliced together The Lost Colony with this book, it covers the exact same time period but from a different perspective. It made the book less interesting than the previous one as you are just waiting for events to unfold. This book is optional in the series but it might be possible to swap it with the previous one. If you are a fan of the series you should get this book, or perhaps you're compelled to read it for completeness sake, in that case you should stop reading reviews and get it already. I'm not a huge fan of retelling stories from other characters' perspectives, and it felt more like a YA novel - which isn't necessarily a bad thing, but felt inconsistent with the rest of the series. A skippable book in an otherwise great series. A repetition of Book 3 from Zoe's first person perspective which adds little to the previous book. This is the last colony for a 12year old. Unfortunately I'm not 12 anymore. As I've come to expect from this series, thoroughly enjoyable and brilliantly narrated. Should have been six stars. If this was a freebie or on sale I probably wouldn't feel so annoyed but having used a credit on it I am. This is the same story as the Lost Colony - the last book in this series - told from Zoe's perspective. Although the perspective adds narrative you didn't get to see in the Lost Colony for me it is just not enough to make a whole new books from. There is no suspense because you already know how the book will end. Also Zoe suffers from the disadvantage of being a 'teenage girl written by an older male author' - I love the author's characterisation usually but boy is Zoe a walking, talking stereotype. Worse she kind of knows she is and keeps saying things like "you'd think being revered by a whole species would make me ... ". This leads to a whole load of listener back-chat where I found myself slapping my forehead and saying "yes Zoe I would think that, I would think your unusual life would make you less of a 2D characture but sadly no". I have to say I couldn't get to the end. It just all got a bit too jaw grinding for me. Now the big question is whether to persevere with the rest of the Old Man's War series or find something new. if you are a teen - listen to this, no need for the others. if you read the others this is a parallel thay basically repeats the last in the trilogy. I loved every minute of this book and recommend it to 10 and upwards. The reader is amazing and really gets you into the story!! Totally recommend this. This was tedious and saccharine. Pure shmultz. I'm not sure what this book contributes to the ongoing series. I have given this author a good go with 8 books. Enough now. This is just a rewrite of Last Colony from a slightly different viewpoint. Don't bother unless you felt that Last Colony needed to be told through the eyes of an annoying, pretentious teenager. The narration is fine but the narrator uses different pronunciation for many names compared to previous entries, which I found confusing and distracting. terrible writing around imagined teenage situations leads to cringe worthy and pretentious dialogue bringing one completely out of the story. Exactly the same as the previous book . What did you like best about Zoe's Tale? What did you like least? Zoe's perspective was good, and a few extra parts of the plot were interesting.What I did not like was that I knew exactly what was going to happen, except for when she was away from the last colony. You can happily skip this book and not miss much. I would have advanced the series not just restate one book from a different characters perspective. This is the laziest thing a writer can do. Tell the exact stale story from another persons perspective then charge there readers for it. Just skip this book, it is rubbish. Just re-tells the previous book from another point of view. What a waste of time and money and a disappointment as this is a really good series. I have really enjoyed this series and while Tavia Gilbert is a favourite narrator I found listening to this irritating. This is an established series with an excellent narrator and to have Ms Gilbert come in and change the pronunciation of names and species, when having a listen to previous work would have kept things consistent without taking away from her mostly excellent performance, really detracted from my enjoyment of this performance. That said while not adding a lot to the series this was an enjoyable reunion with old friends. I absolutely love this book, everything about it is so well done! the story is incredible! the narration was surprisingly awesome and the narrator, Tavia Gilbert, is most skilled at portraying emotion and setting all the characters apart! very impressed overall! I do really wish I actually read the synopsis prior to buying. I was expecting a continuation of the previous book but this was the same timeline with a different character perspective. I knew too much of the story/timeline to make it a knockout. Will not stop me from getting the next one though! I liked this book in the end, at first the change of character and stories from John Perry in space war with interesting sci fi stuff, weird aliens and some political stuff, to now his teenage daughter dealing with teenage girl stuff was a little off putting. glad I listened to it.